The inlet to North Creek, Grand Turk. 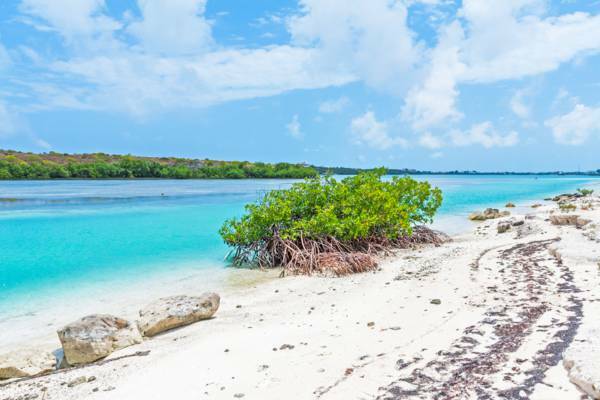 North Creek is a 320 acre (129 hectares) lagoon found in the central northern half of Grand Turk. The body of water is nearly landlocked, with only a small inlet to the ocean at the far northern end of the island. Several sports and activities, both on the land and in the water, take place at North Creek. 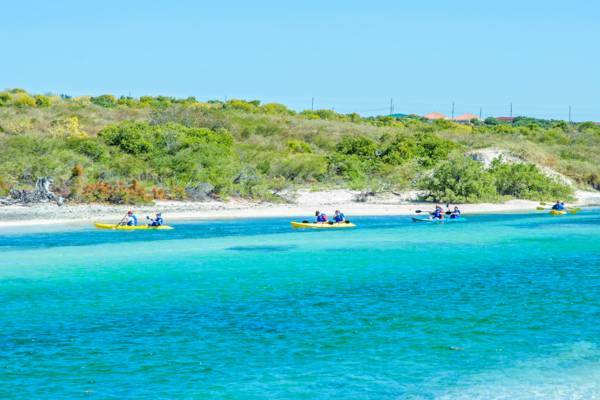 Kayak eco tours, sold as a shore excursion for cruise guests, are currently offered in the mangroves at the north end of the lagoon. 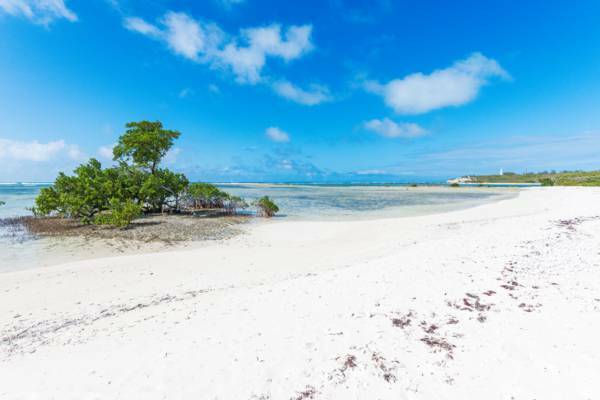 Whilst not the best setting for the sport in the Turks and Caicos (the larger Caicos Islands have far more impressive wetlands), North Creek is interesting and tranquil. Both ATV tours and horseback rides visit North Creek, albeit from opposite sides of the lagoon. The drive to the northwest side of the creek is also quite interesting. On the way out you’ll pass North Wells. Much of the area is low-lying, with salt-resistant wetland vegetation. The hardy and feral Turks and Caicos donkeys are often seen in this region. At Little Bluff Point, the farthest it’s possible to drive to the northwest, excellent sea shell beachcombing can be found. You can also see the Grand Turk Lighthouse from across the inlet. A kayaking tour in North Creek. The inlet that connects North Creek to the ocean has had a history of opening and closing. In 1849, President Forth (we had a presidency back then!) recorded that the entrance originally was 4 fathoms deep (24 feet, or 7 meters), and afforded the inhabitants a safe shelter for small vessels during storms and hurricanes. However, hurricanes that struck in 1815 and 1821 completely refilled the channel, leaving a marsh tidal wetland where the inlet was initially. The pre-1815 depth of 4 fathoms, as suggested by President Forth, is questionable when considering the natural channels and inlets throughout the Turks and Caicos, as no other similar site has quite that depth. President Forth, recognizing the potential of the harbour, attempted to arrange the re-dredging, utilizing English prisoners from Bermuda, blasting, and the budding technology of diving bells. Unfortunately, the scheme was rejected as being too expensive. The concept of re-opening the channel was revisited by the subsequent President Inglis in 1859 with no greater success. The beach at the inlet to North Creek. In 1983, Raul Construction Company began operations to open the inlet. The payment for the project was 76 acres of land near to the dredge site, and partial profits from reclaimed land in the salinas near Cockburn Town, refilled with the material obtained from dredging. Since the dredging in 1983, the channel has partially filled back in, and larger vessels can no longer enter North Creek. Plans to dredge once more are currently being examined. North Creek is the proposed site for the Grand Turk Dolphinarium, an attraction intended as a cruise ship shore excursion. Although largely rejected by both locals in the Turks and Caicos and visitors and interested parties abroad, and considering the global decline of captive marine mammals, the Grand Turk dolphin swim encounter is still being considered (2016).